Even though I can perfectly hear the start up sound and beep sound on my PC running on Windows XP, I am not able to hear the music played in Windows Media Player on it. How can I resolve this issue? To resolve this issue, you should first open the ‘Control Panel’ window by clicking on ‘Control Panel’ option under ‘Start’ button. You should then click on ‘Switch into Category’ option in case it is in ‘Classic View’. After that, you should click on ‘Sound, Speeches and Audio Devices’ option and then on ‘Sound and Audio Devices’ option. Then, you should click on the ‘Sounds’ tab in ‘Sound and Audio Devices’ dialog box. You should make the name of your sound card is displayed under ‘Sound playback’ option and click on the ‘Volume’ button near to it. You can then find ‘Volume Control’ option on the window appears on your screen. You should then confirm whether the check box near to ‘Mute all’ is cleared. After that, you should move up the slider under the ‘Volume’ option. Finally, you should check whether you can hear music from Windows Media Player. If You Not Able To Hear Sound From Windows Media Player Only . . There Is A Problem With The Player Itself . .!! Please Check Whether Your Windows Is Genuine Or Not . . If It's Not ; then cancel the automatic updates . . Even if that doesn't work out better you transform into other players like VLC , Media Monkey etc . .
if you hear a voice then your hardware is ok but if you don't listen any sound then troubleshoot the problem. If you are not able to hear music in the media player. Than first of all make sure that media player is not on MUTE. If it is not on mute and you still cant hear any sounds than i suggest. You should install the sounds drivers on your system again. Make sure that you restart your computer after the drivers installations. 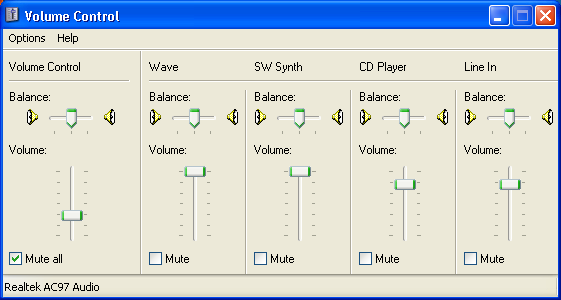 2.In the control panel double-click on the SOUND AND AUDIO DEVICES. 3.In that click AUDIO TAB,there you see MIDI MUSIC PLAYBACK section Make sure that there is a device specified as the default device. 4.Then Click VOLUME BUTTON, that will bring you to VOLUME CONTROL. 5.Make sure that none of the mute buttons are checked.Also make sure that volume slided in the SW SYNTH is all the way up. 6.Then click the close button To close VOLUME CONTROL. 7.then press ok in SOUND AND AUDIO DEVICES PROPERTIES window. Double-click on sounds and audio devices. Select volume under MIDI music playback. set all volume controls to maximum. Now you can hear the music. -->Then click on sounds and audio devises. -->Then you need hit on audio tab. -->Adjust the volume under music player. -->Then set the all volumes to maximum. if you are hot hear your audio. they are few causes is their. follow these steps you fix it simply. - right click on audio icon which will shown on the tray icon. - here one mute option is shown if it is enable please disable it . - then i will not audible you sounds goto next step. step2: go to "control pannel" choose and lunch "hardware and maintenance " and goto the audio device setting. - change audio device that are selected devices are used or not. if not please make it correct one. 3.select "Switch into Category" . 4.Now select the "Sound, Speeches and Audio Devices" option and turn it "on". 5.Click on the "Sounds" tab in "Sound and Audio Devices". 6.click on the ‘Volume’ button . :- a new window will appear choose sound option from here. :- so dear check you system sound from here and tune it to full. It may be hardware or software problem check your window media player working good, To check when you open media player if it will open in proper manner without being hanging or any other message then your media player is being working right. But If your Window Media Player is corrupt Uninstall it or repair it with new media player. If it is not click on Troubleshoot. And your problem will be solved. Windows media player is automatically installed in your computer when you install a Windows OS in your computer . As , you are not able to hear the sound of video or audio in your Windows Media Player maybe it been set as mute . Try to uncheck that button by clicking the button next to the " play/ pause " button . If this doesn't work then surely there must have been some error occurred when windows was installing itself . I advice that download a new and stable version " Windows Media Player 11 " . I think your problem is software related . Just check window update and scan your PC. If it won't solve your problem . Then reinstall you window or update it. 1. First Go to start and. 2. Then click control panel. 3.Then click on sounds and audio devices. 5.Adjust the volume in music player. 6.Then set the all volumes to maximum. There may be certain reasons for your problem. ~> Firstly, check the Sound icon of your Taskbar beside Time. ~> If you are unable to see this icon, then go to Control Panel. ~> You will see Sounds and Audio Devices. ~> Now open this and check the box of "Place Sound icon in Taskbar". ~> Now, click the icon and check whether sound is on or not. ~> If it is muted, then unmute it. ~> Secondly, check the sound of your Player. ~> Check the Volume of your Player. ~> If it is very low, then increase it. First i would say that try playing songs in other players such as km player or vlc or gom player. If it works then the windows media player is not working. If still it doesnt work check if you have installed the volume driver or not. 2. Go to the Control Panel. 3. Here, in the dialog box of control panel, select the "Sound and Audio Devices." 4. Now, click on Audio Tab, here in the MIDI MUSIC PLAYBACK section check out that there is a device specified as the default device. 5. Then Click on VOLUME button, that will bring you Volume Control. 6. Mute button should be unchecked here and volume slide in the SW SYNTH should be way up. 7. Close the Volume Control. 8. Press OK in the Sound And Audio Devices Properties Window. 9. Now, restart your Player. in your Windows Media Player or you can change the settings there in the Media Player. software so that you can able to fix your problem. 1. check your windows media player mute mode. and make a setting manualy. Then set the volume by sliding the slide bar under volume. Open the Home Screen ..
Go to the START menu ..
To settle this challenge, you must primary start your ‘Command Cell'home window by simply pressing ‘Command Cell'selection below ‘Start'button. You should then click ‘Transition in to Classification'selection should them is within ‘Basic Check out '. Next, you must click ‘Audio, Speeches and Sound Devices'selection and that point on ‘Audio and Sound Devices'option. Subsequently, you must go through the ‘Sounds'tab around ‘Audio and Sound Devices'dialog box. You should produce the naming of your current audio cards is actually shown below ‘Audio play'selection and then click your ‘Amount'key in close proximity to it. After that you can find ‘Amount Command'selection upon the window seems in your screen. You should then confirm whether or not the verify package in close proximity to ‘Mute all of'is actually cleared. Next, you must shift on the slider under the ‘Amount'option. Lastly, you are able to whether or not you can hear songs out of Microsoft windows Advertising Player. It may be components as well as software program dilemma verify of the question marketing player doing work great, To test when you start marketing player in the event it's going to start around appropriate approach without being holding or some other communication then your marketing player is it being doing work right. Nevertheless In case your Window Advertising Gambler is actually damaged Remove them as well as remedy a repair along with new marketing player.